Ioannis Kalamaras was an outstanding student. He joined our A-level programme and completed three demanding A-levels (Mathematics, Economics and Further Mathematics) in just one year while also attending the final year at Lykeion. This Herculian task did not seem to daunt Giannis who went on to achieve the highest mark in the world in A-level Mathematics. 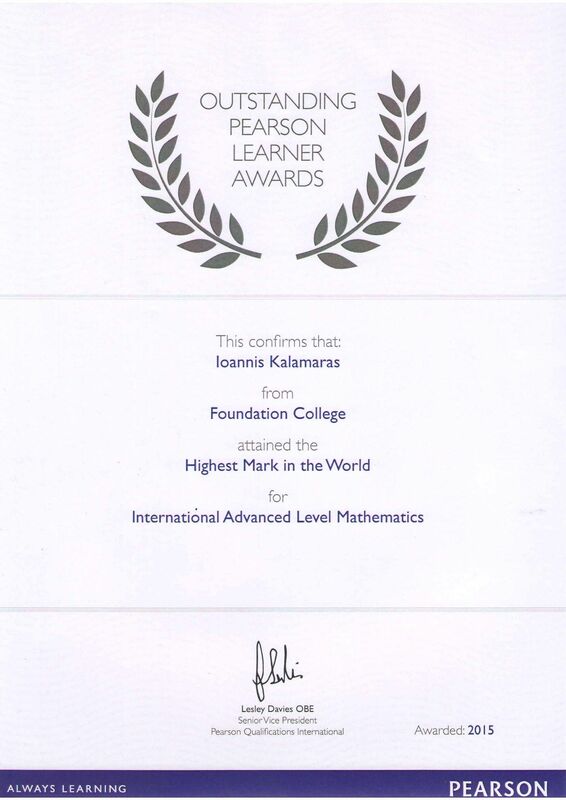 Bearing in mind that Mathematics is a very popular subject with tens of thousands of takers - including some notorioulsy hard-working South-East Asians - his achievement is truly singular. Our contribution to his achievement was probably very small as he was (and still is) a superb student who would have achieved his A*A*A with or without our help. What makes us proud is that he had chosen to come to us to help him take on this formidable task. Ioannis is currently on his way to a first class degree at the prestigious University of Bath and we are certain that his outstanding achievements will keep coming.